If you have never traveled to the Canadian Rockies, you should. After visiting Estes Park in Denver, I thought I could never see anything more spectacular, but the Canadian Rockies are Denver times ten. They are incredible, spectacular; one runs out of words. This hub will be the story of our trip there in 2007. My husband and I have been sitting with maps and photos, trying to put it together and reliving a truly marvelous time. If some of the highways are incorrect, feel free to correct me. It's been a few years since we went and we're going on memory. This trip was planned to end at Baitmasters Hunting Lodge in Green Lake, Saskatchewan, . My husband had hunted there several times before this trip, and I had gone with him once before. I will end this story before we arrive at the lodge and leave the days at the lodge for another hub. Our time there with Sylvia and Brian Hoffart, the outfitters who run the place, was always an adventure. They are kind and generous people who made our trips to their lodge seem more than anything like a visit with family. This Elk Didn't Like Me. We flew from our home in New Orleans to Minneapolis, then to Calgary. In Calgary, we rented a car. The weather was warm but nothing like the sauna we left in New Orleans. It was around Memorial Day weekend. 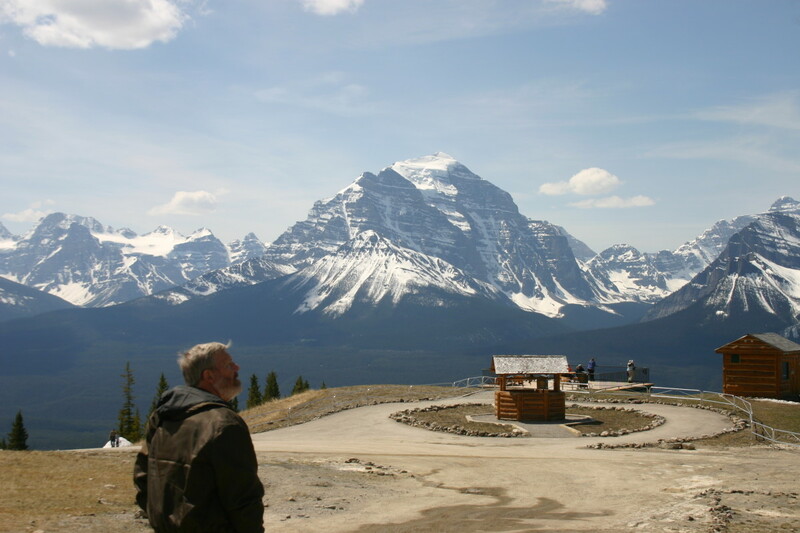 From Calgary, we headed north on Trans Canada Highway to Banff. Banff is a beautiful place and had a festival going on with bright colors and displays everywhere. We continued north on Bow Valley Parkway, (Highway 93). As we drove, we encountered all sorts of wildlife, including a huge elk that decided I was getting a bit too close while making his picture and pawed the ground and snorted at me! Joe laughed when I ran to the car. It was pretty terrifying. 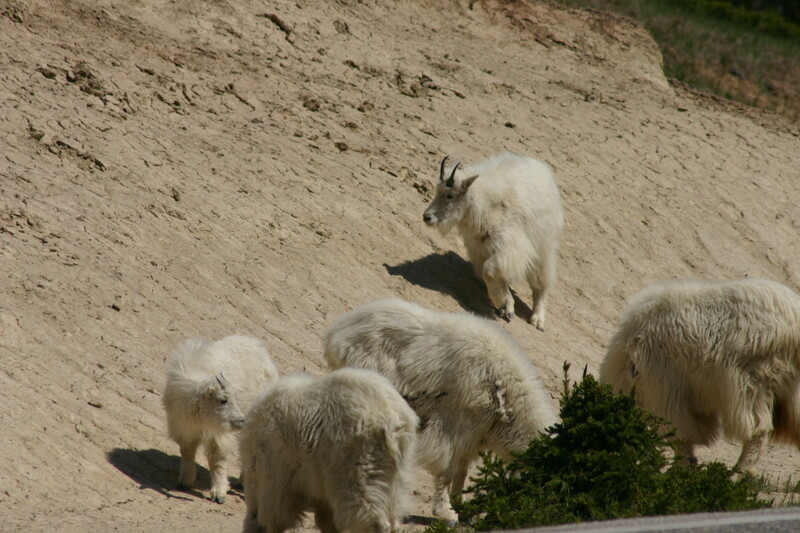 We saw mountain goats crossing the highway. The traffic stops and lets them pass. 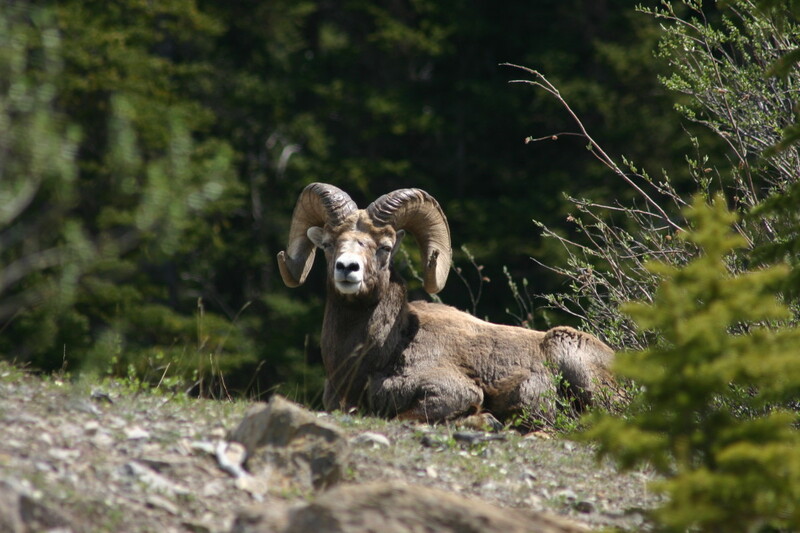 We saw bighorn sheep lying on the rocks above the parkway, gazing down at us as though we were their subjects. We saw a small bear scurrying along the edge of the parkway. It was as if the wildlife decided to give us a show. Traffic Stops for These Mountain Goats. We made our way slowly along the Parkway, stopping for the goats to pass, stopping to make photos of the sheep, and definitely leaving the elk alone. Having something that large stomp its foot at you is a frightening thing! We eventually made our way to our destination for the evening. We stayed on the Parkway in the Baker Creek Chalets in a cabin called the "Trapper's Cabin." 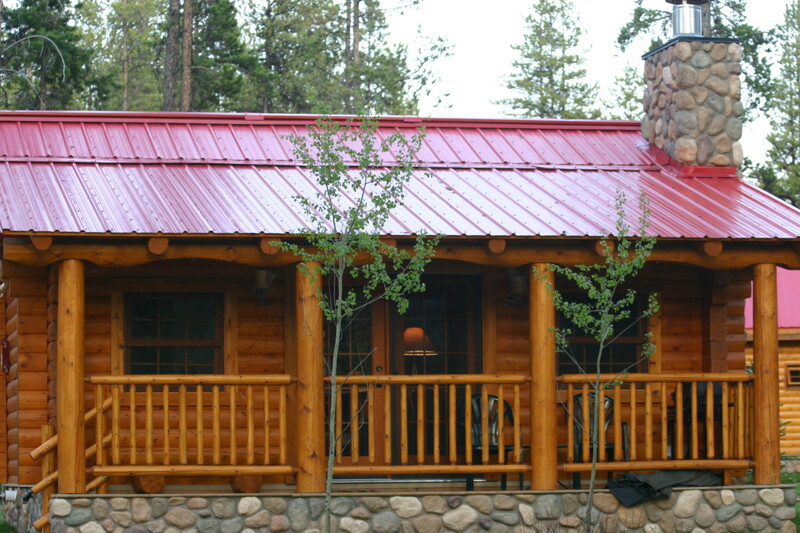 It was spacious and nice and we had a large back porch overlooking the forest and a barbecue grill. We left to get groceries and that night enjoyed a wonderful steak. While Joe was cooking our steak and eating potato chips, a raven flew down and snagged the bag of chips he had put down. We loved the "Trapper's Cabin." There was a book there where guests had written their stories. Some were on their honeymoon, one couple was making a last trip, hoping to save their marriage, one couple had lost a child and were trying to move past it. It was moving to read their stories and I wrote ours, telling of our many years together, our children, grandchildren, and our lives in New Orleans. 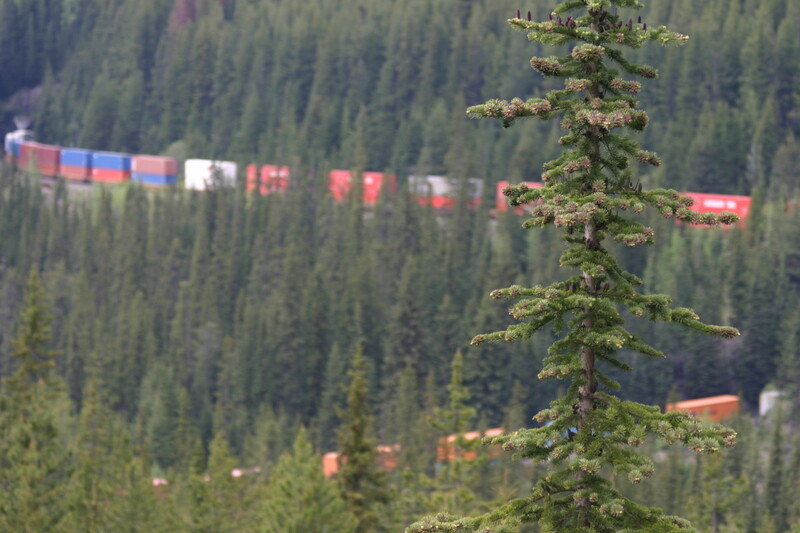 We were intoxicated with hearing the sound of the trains of the Trans Canada Railroad, which ran just across the highway from our cabin. 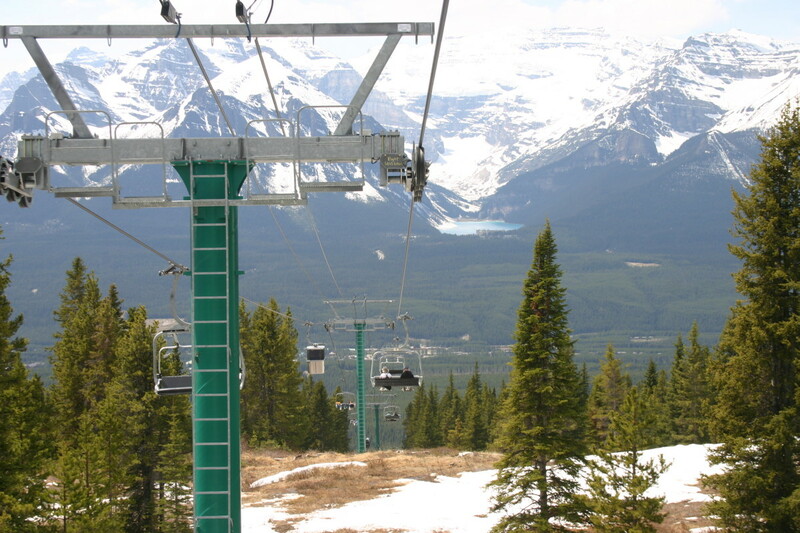 The next day, in Banff, we rode a ski lift. It was beautiful, but I have a terrible fear of heights and was frozen with terror. Joe, who is a hunter, saw a bear and kept twisting around making our seat rock. I could have easily choked him if I hadn't been so afraid to move. I was so very glad to get out of that gondola! Lake Louise was just across the Trans Canada Highway from our cabin. It is considered one of the Seven Wonders of the World. I believe it is highly under-publicized and under-rated. I have never seen anything so beautiful anywhere. The water is totally clear. The two mountains with the lake in between make for a awe-inspiring sight. It's one of those things you look at and hold your breath! We made hundreds of photos and walked all around it, being stalked by the ground squirrels that were quite tame and hoping for treats. We also visited Lake Moraine, which is gorgeous, just not as large as Lake Louise. We drove north on Trans Canada Highway, crossing Kicking Horse Pass. We watched a train go round and round a mountain and in and out of tunnels as it traveled. It was a mind-boggling thing to watch. We went to Golden, British Columbia, then through the hamlet of Field, Alberta, and finally back to our cabin. One of the things we noticed in Canada is that it is pristine. People there don't throw trash out of their cars or leave trash when they finish eating. Everyone seems to be super-conscious of keeping things clean and sparkling. The Canadian people that we met were helpful, friendly, and curious about us and where we were from and where we were going, all in a very pleasant way. The next day, we left the Trapper's Cabin and headed north towards Jasper on Highway 93. We eventually reached the Icefield Center across from Athabasca Glacier. We took a huge ice truck out onto the glacier. Athabasca Glacier is one of the five principal "toes" of the Columbia Icefield. 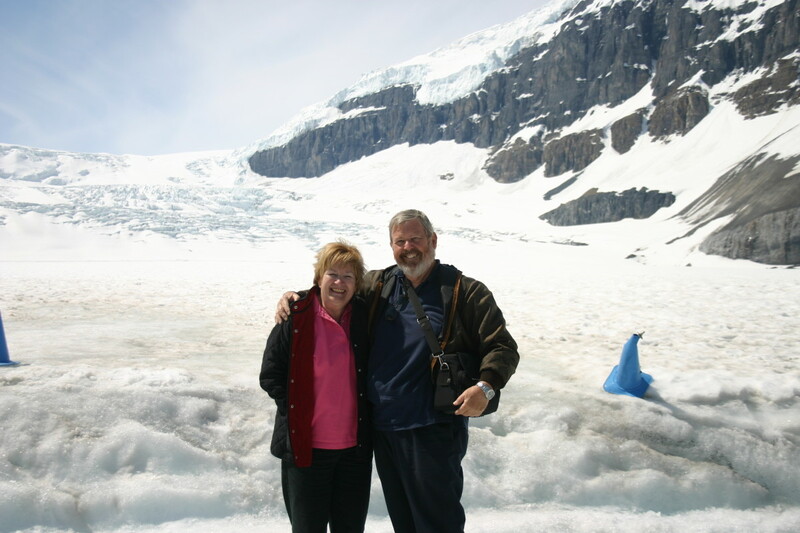 The glacier recedes at a rate of 6.6 to 9.8 feet per year, according to our guide, and has lost half its volume. Riding in the ice truck was an experience in itself, listening to the history of the glacier. Some on the tour chose to remain on the bus, but we got off, visiting with other passengers from the truck and throwing a snowball or two. What an incredible feeling to be walking on a glacier. This was one of the highlights of our trip for me. After leaving the icefields, we got back on Highway 93. The goats were crossing and we had to wait for them to pass, while being looked down on by the bighorn sheep. We spent the night in Bonneville. The next day, we drove to Cold Lake and ate lunch there, overlooking the lake, which was serene and quite wonderful, as was our lunch, with wonderful wine and excellent goat's cheese. After that, we headed east on 55, then north on Highway 2 to Prince Albert Park. We drove around in the park, which is huge, and enjoyed seeing the gorgeous trees. My husband saw a huge whitetail deer, which made his whole trip. The park is full of wildlife and birds we had never seen, so we stayed a while, stopping often to make photos. We eventually took a gravel road that wound around the northern end of Prince Albert Park. Brian Hoffart, the owner of the hunting lodge, had told us about it. It was Sunday, and we were on that gravel road for 90 miles. The only other human being we saw during the entire trip was a man on a grader, grading the road. We were thrilled to see him! It was a scenic drive and much more pleasant than the highway would have been but we were both thinking, as we later told each other, what a horrible place to have car trouble! But the rental company evidently took good care of their vehicles; and we made it without a problem, although we were a bit relieved to reach the highway and head to Baitmasters Lodge. We spent four glorious days at the lodge, but I will save that for another day and another story. 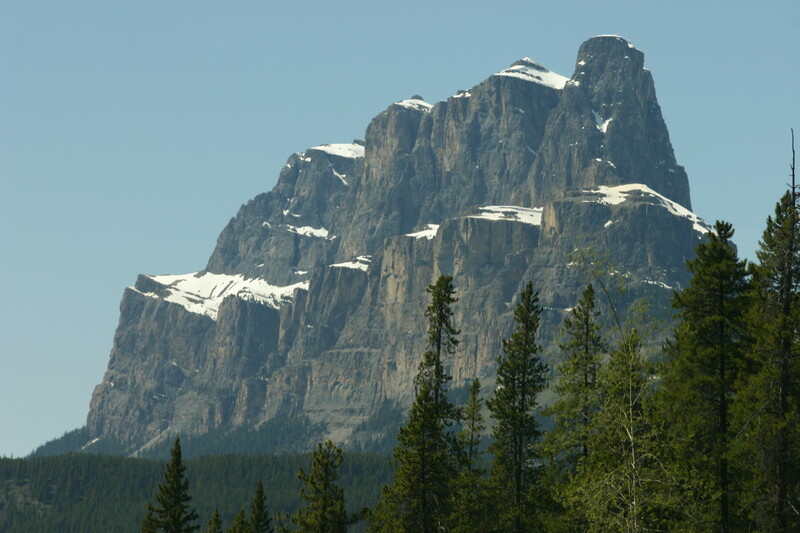 If you are contemplating taking a trip anytime soon, consider the Canadian Rockies. There are three places that totally lived up to my expectations when I visited them. Most vacation spots I've heard about seemed anticlimactic when I finally saw them. The three that didn't were Sedona, Arizona; New England during leaf peeping season, and the CANADIAN ROCKIES. After reliving this trip while writing this article, I would recommend it to anyone. 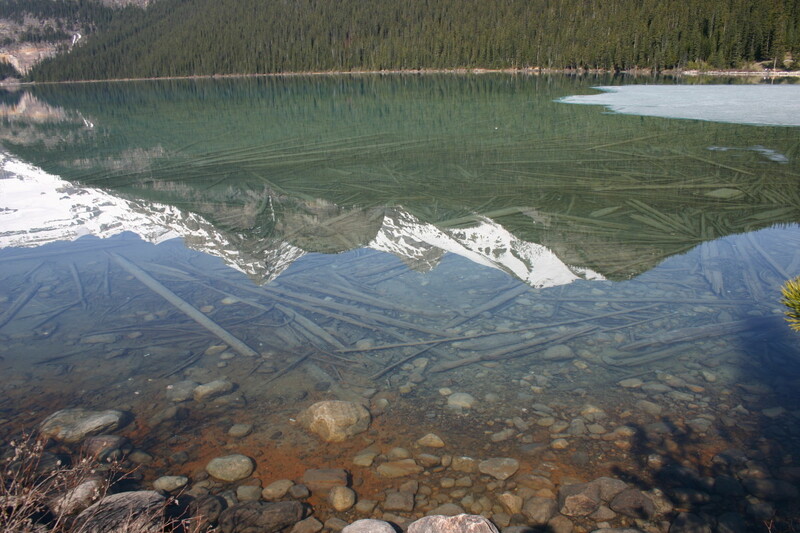 The Water of Lake Louise Is Crystal Clear. We have not traveled a huge amount, but have been to Spain and Switzerland and several of the states, and this trip to the Canadian Rockies remains my favorite. Colorado is beautiful, especially Estes Park. 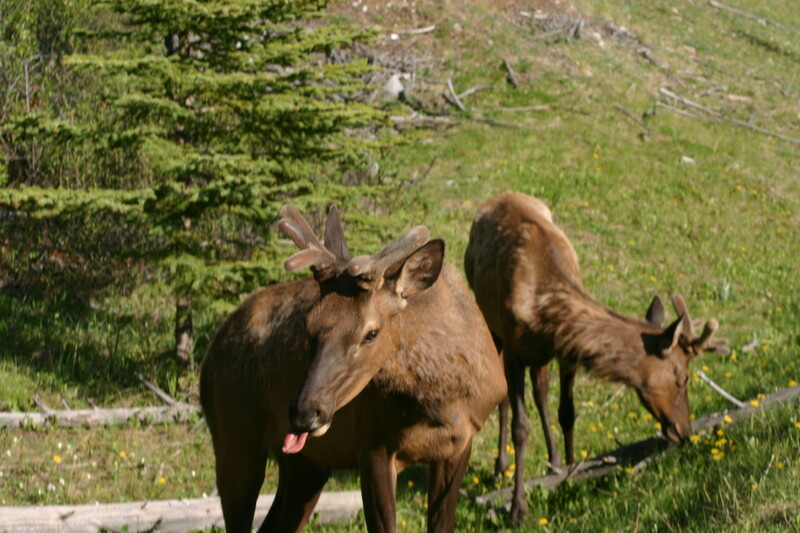 We have gorgeous photos of some bull elks we saw there. Snowboarding sounds fabulous too. Lake Louise is considered one of the wonders of the world and I now understand why. It is literally breathtaking. Thanks for your comments! 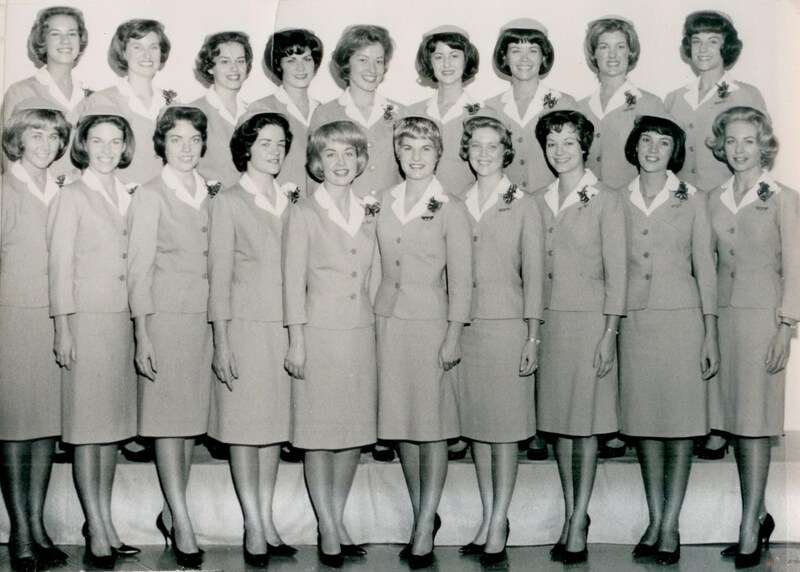 Wow - this is the trip of a lifetime! 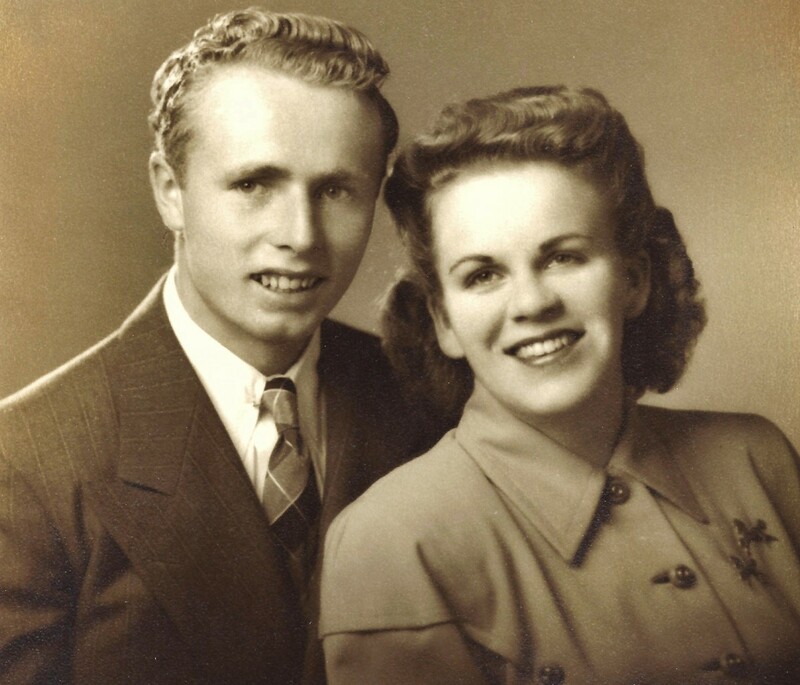 My brother's first marriage was in Longmont, CO. While there, we all took a tour of Estes Park. It was a blast. I have since skied / snowboarded on Colorado, and that definitely was a fabulous experience; it was like floating on air. 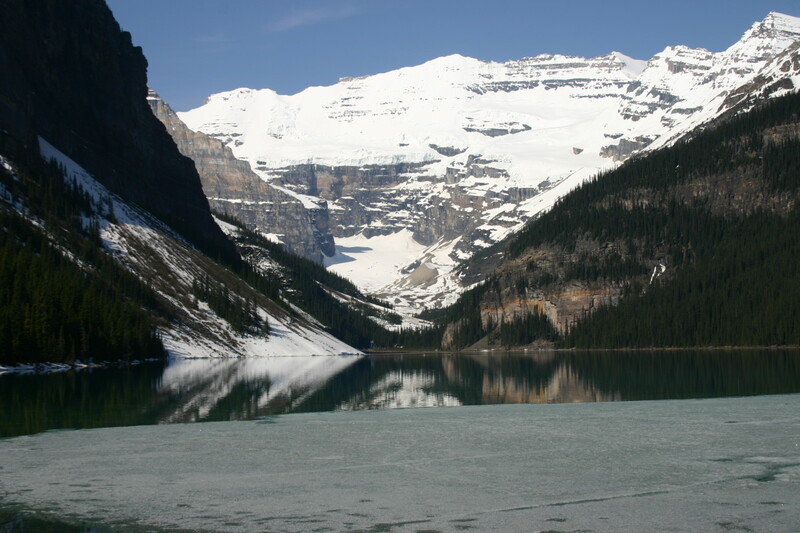 I especially like the picture of crystal clear Lake Louise. You should post it upside down - lol! I am so glad to hear from someone who loved it as much as I did. I think it is so under-advertized! That was one of my all-time favorite trips ever. I still look at the photos occasionally. Ooh, Marsei, I so want to go back there now! We flew in to Vancouver, stayed on fabulous Vancouver Island for a week, then drove up to Banff. The road to Athabasca Glacier is amazing, stunning scenery with every turn. Breathtaking. After a few days in and around Banff we flew home from Calgary. I just have to get back there some time soon. Thanks for the lovely reminder.